Cindy, Trish and Nell - helping shelters help everyone. When I grew up, animal shelters were chaotic, overcrowded, feared destinations from which animals were unlikely to return. That has changed rapidly. Shelters are transforming into adoption centres, pro-actively promoting animal welfare and increasingly analysing data to improve their performance. Two people who have been influential in this field are Nell Thompson and Dr Cindy Karsten. Nell was appointed as Coordinator of the national Getting 2 Zero program in July 2012. Nell has worked in the animal welfare, care and veterinary sectors for over 20 years and was the Victorian G2Z representative since the development of the G2Z program. Her background in shelter operations and management and animal health is a great resource for Councils, shelters and all groups and individuals involved in the program. Nell is passionate about improving outcomes for pets who enter the shelter and pound systems and strongly believes that the best results occur when animal welfare and animal management are working together towards the same goals. Cynthia (Cindy) Karsten, DVM graduated from the University of Wisconsin School of Veterinary Medicine in 2010 and went on to complete a shelter medicine internship at Colorado State University. She finished her Shelter Medicine Residency at UC Davis in 2014 and is now the Outreach Veterinarian with the UC Davis Koret Shelter Medicine Program. Her main areas of interest include infectious disease control, population management, intake diversion/pet retention programs and community medicine. She has participated in numerous game-changing shelter consultations at both rural and urban, national and international animal care facilities, where she has identified far-reaching solutions in the face of limited resources. How did you get together and end up collaborating? I was looking for a speaker to present on shelter med issues for the 6th National G2Z Summit (a biennial nationalconference on companion animal welfare and management issues) and contacted Dr Kate Hurley of the UC DavisKoret Shelter Medicine program. Kate presented for us in 2011 and suggested Dr Cynthia Karsten would be a good match for our needs and audience. 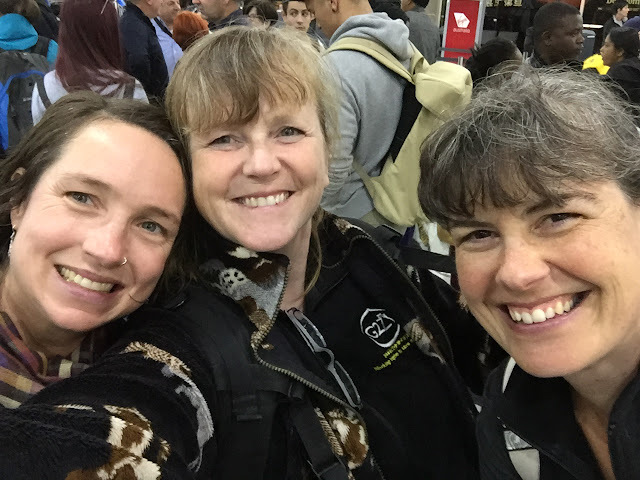 Needless to say Cindy was a huge success and we invited her and Trish McMillan Loehr to visit an Australian shelter with us to do a shelter consultation. The combination of the shelter med and behaviour perspectives was identified as being extremely valuable and covered the spectrum of shelter issues and challenges very nicely providing holistic solutions and recommendations. This visit was so successful that we decided to offer the Australian shelter, rescue and pound community the opportunity to tap into this expert resource and we have just completed a 3-week road trip covering two states and visiting 7 organisations. The feedback has once again been fantastic and we are looking forward to travelling to other states next year to spread the progressive sheltering word! Why, in the age of huge awareness about responsible pet ownership, do we still find so many companion animals in shelters? “Responsible pet ownership” means many different things to different people. I think we need to be clearer on what we (in the sector) need this to mean to people i.e. Desex, Identify, Train and Keep Safe. We also need to empower people to do this by employing supportive, non-judgemental and non-enforcement means. Basic vet care (i.e. desexing surgeries, vaccination, microchips) is out of the reach of many pet owners. Just as basic health care would be out of their reach if we didn’t have Medicare. Perhaps we should be considering spending the enormous amount of money, spent by not-for-profit and Local Government each year on housing and disposing of stray and unwanted pets, on preventive strategies such as low/no cost desexing, low/no cost pet training classes and a myriad of other supportive measures. The topic of ‘responsible pet ownership’ has been a very common topic for discussion lately and was actually a special session at the recent 2016 HSUS Animal Care Expo in Las Vegas. A recent HSUS blog post discusses an important way to consider‘responsible pet ownership’. How can the numbers of animals in shelters be reduced? Most pets end up in pounds and shelters as strays and many of these are microchipped but the details are often not up to date making contacting the owner difficult, if not impossible. This is a message we have not successfully integrated into the community. Are we furnishing newly adopted and reclaimed pets with a good ole fashioned collar and tag? The research shows this works best when physically placed onto the pet at the time of release. [Ed. Definitely very helpful - often means that animals are returned to owners within minutes, if not hours, of being lost]. Cats are still the main issue when it comes to overpopulation, we need to ut more resources into low/no cost desexing while also considering changes to management of cats by shelters and pounds in general. Educating and training veterinarians on paediatric desexing of cats is extremely important as cats can be ready to breed by4 months of age. The data shows that >90%of owned cats are desexed but this is unfortunately taken from the information relating to registered cats. There are many people who still do not register their cats (for a variety of reasons) so this is giving a false impression of the numbers of pet cats that are desexed. It also does not take into account those cats that were desexed after they had an “oops” litter which is happening commonly with cats. Desexing them after they have bred is great but it would be better to have done it before the horse left the stable in the first place. The three main reasons why people do not desex are: lack of knowledge (didn’t realise siblings can breed, didn’t realise cats can breed so young etc. ), lack of resources (money, etc.) and access to affordable services. You can live in the suburbs but if you do not have a car or someone to drive you, a cat carrier and the spare money it can all get too hard really quickly. The other major driver of pets into pounds and shelters is the lack of pet friendly accommodation. The HSUS is taking this on with their new initiative Pets Are Welcome. Some shelters talk about resurrender of animals following a “honeymoon period”. What is the honeymoon period? Not sure about this one so can’t comment. I’ve never really heard shelters talk about this but I do always talk with shelters how the adoption is the start of a relationship with folks in the community and not the end of the relationship with the animal. Let folks know that the shelter is there to support the new owner and the pet in any way that they can. However, if it is not working out, no pressure, the animal is also always welcomed back or support them in rehoming the pet on their own. What can be done to reduce resurrender of animals? We can try to make the best match that we can at the time of the adoption and then support, support, support! What do we need to do to help keep that pet in the home? If a pet is resurrendered after a recent adoption, then we need to take the opportunity to learn more about how that pet was in the home so that we can find a new home that is more suitable or help that pet through rehabilitation if required. We can also try to find a more suitable pet for that adopter rather than push them away which will mean pushing them towards a pet shop or online purchase. This goes for pets being surrendered in the first place as well as strays being reclaimed by their owners. Are they having problems with behaviour? Fencing issues? Affording food and/or medical care? It will be less expensive for us in the long run if we can meet people where they are at and work with them to keep their own pet. One criticism of the “adopt-don’t-shop” model is that many suitable pet owners are not deemed suitable as adopters by shelters. Is this a recognised problem? Looking at the prohibitive messages that many shelters and rescues have on their websites, before the potential adopter has even got in front of the pets in their care I would say yes. Add to this some of the less than flattering descriptions and write ups commonly seen on cage cards and internet profiles it’s not surprising that many people are still sourcing their pets from online sources and pet stores. Requirements such as home visits, landlord checks, no kids under whatever age, etc., etc. are just putting barriers in the way of potential adopters. Add to that the cost of adopting a pet and it’s enough to tip people over the edge. While it is still possible to obtain a kitten free to good home in the community we cannot afford to be putting excessive adoption fees on our pets (particularly cats). Fee waived does not mean care waived. We can still use our regular adoption processes (as long as they are reasonable!) but ask for a donation at the time of adoption rather than a required fee. It’s not reducing the value of the pet in the adopter’s eyes, there is plenty of research around this that shows these pets are just as valued as thosepurchased elsewhere for higher amounts. We have to trust, support and enable the community to do the “right” thing. Just hanging onto these pets in our shelters is not the answer. They don’t get “better” being incarcerated. It’s not even the answer in a foster home as we need to make way for the next one needing our help. We hear about puppy factories and see footage in the news of ghastly, squalid conditions. Surely this can’t be that common in Australia? It is fairly common in Australia, they are often located in rural areas and out of the way so many people do not realise how many there are. People may also not pick up their new pet from the actual location it was bred in (i.e. purchasing online, pet store or meeting at a pick up location) so they do not realise where the pet originated. Many of these dogs are sold on-line and thus buyers do not have a clear picture of where the dogs are coming from and the lack of welfare afforded to them. What can be done about puppy factories? It is certainly an animal welfare issue due to the conditions these animals live in but it is probably not the greatest contributor to our companion animal welfare and management issues. We need to encourage legislation such as Breeder Permit legislation which requires an inspection using best practice (not minimum standard) compulsory standards and the breeder using a traceable permit number when advertising their offspring. This way the consumer can trace the origins of the pet, be confident it was bred and raised in the very best of conditions and the welfare of all animals involved is assured. In terms of our stray and unwanted companion animals we need to look at our data. This sector has not been great at collecting and reviewing relevant data. We need to do this in order to develop and implement strategies to solve the issues facing the sector. Who are the animals coming in to our facilities? Where are they coming from? What are the barriers facing them in regards to leaving these facilities healthy and happy? A good place to start is ensuring that all pet owners have access to affordable (to them) pet care and food/supplies needed for their pet. Supporting all pet owners to allow them to care for their pets to the best of their capacity will keep both pets and people happy together. Learn more about Shelter Medicine! It’s not just about desexing, vaccinating and euthanizing. It’s the science behind good shelter and pound management, the whole story. Learn to desex paediatrics and take those skills into your new job. If your bosses are not comfortable doing it ask them if you can offer that service. Learn about companion animal behaviour, and human behaviour! And remember why you went into this profession in the first place. When you can be anything, be kind. Thank you Nell and Cindy. Its great to see these kind of initiatives empowering shelters. For more info check out the Getting 2 Zero site here.